Grand Illuminated Lectionary from Spain. Two folios on vellum. Spain, ca. 1500: 374 mm x 267 mm (justification, 262 x 174 mm). Single column, 21 lines. Unfoliated. Decoration: fol. 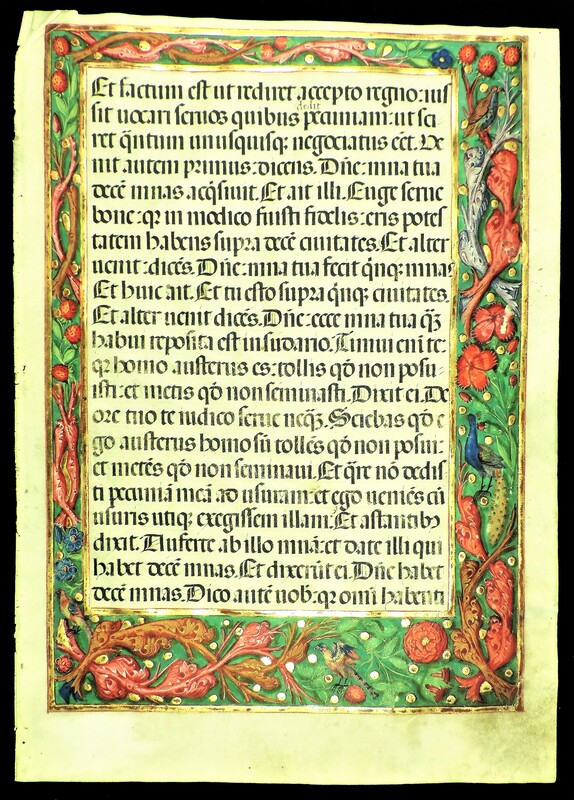 1. four-sided borders edged in gold infilled with (recto) magenta twigs and foliage, colorful birds, peacock, and gold bezants; (verso) triangles and lozenges with IHS and bright blossoms, strawberries, a single bird, and gold bezants; two-line gold initial on colorful grounds with blossoms; rubricated; 2. 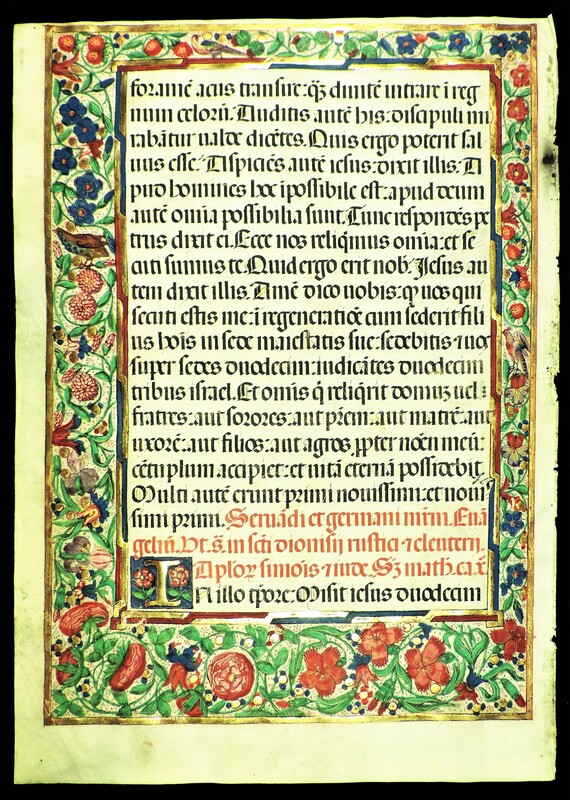 (recto) a profusion of green curlicue foliate stems with melons, grapes, strawberries, thistles, cherries, blossoms, and gold bezants, with a peacock below; (verso) a profusion of pink blossoms, three birds, and gold bezants; three two-line gold initials on bright grounds with colorful blossoms; rubricated. 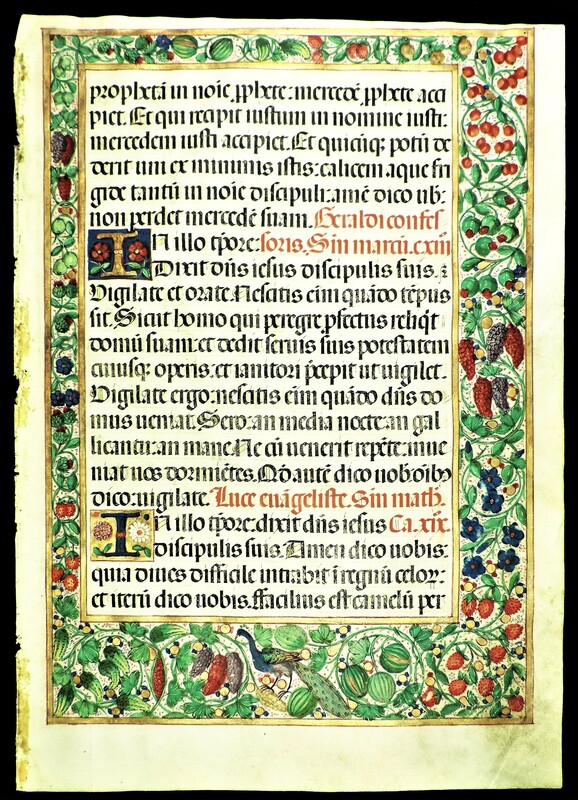 Texts: This is a section of the Sanctorale with Gospel lessons for the feast of SS. Dionysius, Rusticus, and Eleutherius (9 October, fol. 1) and Geraldus (13 October), Luke the Evangelist (18 October), and the Apostles Simon and Jude (28 October, fol. 2). 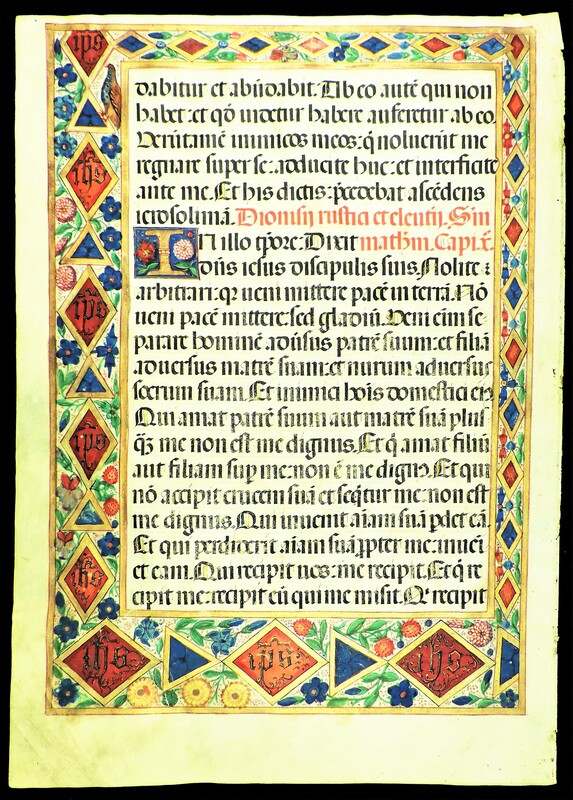 Condition: fine; thumbed in lower right-hand corner, some slight creasing, loss of gold on borders through contact wear. Generally bright and clean.